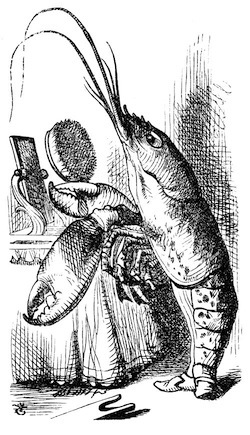 "You may not have lived much under the sea " ("I haven't," said Alice)  "and perhaps you were never even introduced to a lobster3 " (Alice began to say "I once tasted " but checked herself hastily, and said "No, never") " so you can have no idea what a delightful thing a Lobster-Quadrille4 is!" "No, indeed," said Alice. "What sort of dance is it?" "Why," said the Gryphon, "you first form into a line along the sea-shore "
"Two lines!" cried the Mock Turtle. "Seals, turtles, salmon, and so on: then, when you've cleared all the jelly-fish5 out of the way "
" you advance6 twice "
"Of course," the Mock Turtle said: "advance twice, set to partners "
" change lobsters, and retire7 in the same order," continued the Gryphon. "Then you know," the Mock Turtle went on,"you throw the "
" as far out to sea as you can "
"Turn a somersault8 in the sea!" cried the Mock Turtle, capering9 wildly about. "Back to the land again, and  that's all the first figure10," said the Mock Turtle, suddenly dropping his voice; and the two creatures, who had been jumping about like mad things all this time, sat down again very sadly and quietly, and looked at Alice. "There's a porpoise12 close behind us, and he's treading on my tail. They are waiting on the shingle13  will you come and join the dance? Will you, wo'n't you, will you, wo'n't you, wo'n't you join the dance? "Oh, as to the whiting," said the Mock Turtle, "they  you've seen them, of course?" "Yes," said Alice, "I've often seen them at dinn " she checked18 herself hastily. "I believe so," Alice replied thoughtfully. "They have their tails in their mouths19  and they're all over crumbs." "You're wrong about the crumbs,"20 said the Mock Turtle: "crumbs would all wash off in the sea. But they have their tails in their mouths; and the reason is " here the Mock Turtle yawned and shut his eyes. "Tell her about the reason and all that," he said to the Gryphon. "The reason is," said the Gryphon, "that they would go with lobsters to the dance. So they got thrown out to sea. So they had to fall a long way. So they got their tails fast in their mouths. So they couldn't get them out again. That's all." "Why, what are your shoes done with?" said the Gryphon. "I mean, what makes them so shiny21?" Alice looked down at them, and considered a little before she gave her answer. "They're done with blacking22, I believe." "Soles and eels23, of course," the Gryphon replied, rather impatiently: "any shrimp could have told you that." "If I'd been the whiting," said Alice, whose thoughts were still running on the song, "I'd have said to the porpoise 'Keep back, please! We don't want you with us!'" "Wouldn't it, really?" said Alice, in a tone of great surprise. "Of course not," said the Mock Turtle. "Why if a fish came to me, and told me he was going on a journey, I should say 'With what porpoise?" "I mean what I say," the Mock Turtle replied, in an offended tone24. And the Gryphon added "Come, let's hear some of your adventures." So Alice began telling them her adventures from the time when she first saw the White Rabbit. She was a little nervous about it, just at first, the two creatures27 got so close to her, one on each side, and opened their eyes and mouths so very wide; but she gained courage as she went on. Her listeners were perfectly quiet till she got to the part about her repeating "You are old, Father William," to the Caterpillar, and the words all coming28 different, and then the Mock Turtle drew a long breath, and said "That's very curious!" Trims his belt and his buttons31, and turns out his toes. "She ca'n't explain it," said the Gryphon hastily. "Go on with the next verse." "It's the first position in dancing,"34 Alice said; but she was dreadfully puzzled by the whole thing, and longed to change the subject. "Go on with the next verse," the Gryphon repeated: "it begins 'I passed by his garden.'" "What is the use of repeating all that stuff?" the Mock Turtle interrupted, "if you don't explain it as you go on?38 It's by far the most confusing thing I ever heard!" "Shall we try another figure of the Lobster-Quadrille?" the Gryphon went on. "Or would you like the Mock Turtle to sing you another song?" "Oh, a song, please, if the Mock Turtle would be so kind," Alice replied, so eagerly39 that the Gryphon said, in a rather offended tone, "Hm! No accounting for tastes!40 Sing her 'Turtle Soup,'41 will you, old fellow?" Waiting in a hot tureen 42! Beau  ootiful Soo  oop! In a manner of speaking, every human being does have a bone in their throat, and we need it to speak. It is called the hyoid bone, and the muscles of the tongue and the bottom of the mouth are attached to it. The hyoid doesn't articulate with any other bone, and since it is small it doesn't tend to fossilize, contributing to the ongoing arguments among some anthropologists over whether Homo neanderthalensis could speak or not. If you have any other bone in your throat than an appropriately installed hyoid, then chances are you are in the emergency room getting ready to have it removed. As may be expected, the bones people most often get stuck in their throats are fish or chicken bones. This can seem surprising if it is true that drunken individuals often end up in the emergency room because they have managed to swallow their toothbrushes. Today this would be the first step before resorting to the Heimlich manoeuvre. It seems to work on the basis of forcing the choking person to gasp or cough, hopefully blowing the blockage out of their windpipe. If you should have the dubious fortune to need to apply the Heimlich or have it applied to yourself, your next stop should be the previously mentioned emergency room to have the damage to your ribs patched up. In north america, lobsters were widely considered poverty food, the sort of thing fishing families had to eat instead cod in places like newfoundland. Today lobster is expensive fare indeed, and lower income fishing families in newfoundland likely never get to eat them unless they happen to be lobster fishers experiencing a successful season. I shudder to think what the world will have come to if true low income fare like ichiban noodles ever make such an ascent. Chances are that if you have ever been in rural North America, or subjected to a 'dance unit' in a physical education class, you're familiar with at least one quadrille: the square dance. According to my Oxford English Dictionary, a quadrille is a square dance done by four couples made up of five different dances. The square part derives from where the couples stand at the beginning, one couple on each side of the square. Besides the musicians, there is one more person at a square dance, the caller. The caller's task is to shout which dance the couples are supposed to do. In north america at least, square dancing calls are almost wholly in french, reflecting the ultimate origins of the dance. The Mock Turtle says that the dancers start in two lines rather than a square, which would be a reasonable workaround in the event that there were more than four couples involved in the dance. It would be important to clear the jellyfish out of the way, since they capture prey by stinging them. They are not true fish, which are free swimming sea creatures that have bones and highly specialized internal organs. Jellyfish are free swimming, but boneless with less specialized internal organs. In fact, they seem almost like a fancy sort of round worm. Although jellyfish are most famous for being dangerous to people, few jellyfish have deadly stings, and a few are even edible with appropriate processing. I'm not sure if this means 'you take two steps forward' or 'you step forward, then back, then forward again.' I can't remember enough from that dreadful dance unit in phys-ed class! 'Figure' in this case referring to the first dance in the quadrille. As noted above, there would be at least four more. 'Whiting' is another word that has been applied to widely varying things, and two of those things can be found in the sea. One is an edible fish similar to cod, the other a grade of chalk used in paint. All chalk derives originally from the remains of shellfish, and of course chalk is a major part of the famed white cliffs of Dover. However, chalk whiting is necessarily not long-lasting; such paint may wash away or become discoloured by other chemicals. These disadvantages led to a the development of lead-based white paint, which is now banned since lead is toxic. A porpoise is a small whale; I have heard this name (very) loosely applied to other sorts of whales, including dolphins and orcas. I am accustomed to this word referring to the rectangle, flat things you can nail on your roof to weatherproof it. By analogy, I expected the word to refer to a rocky shoreline with a rather horizontal ledge. According to my trusty electronic OED the term means something quite different: a mass of rounded pebbles. That doesn't really make sense, so I turned to my paper OEED (etymological dictionary) which defines 'shingle' as a beach covered in round pebbles as well as something you nail on your roof. The second beach-oriented definition makes much more sense. Snails, also called gastropods 'stomach-foots' because they have no legs and crawl, are invertebrates usually equipped with a shell they can pull themselves into when threatened. One of the most famous sea snails is the chambered nautilus, widely considered a living fossil because it has apparently hardly changed at all in over 400 million years. It also famous for the spiral its shell develops as it grows, an instance of the Archimedean spiral in nature. Snails being one of the archetypal slow movers (along with land turtles and molasses in january before climate change in the northern hemisphere), distance from the starting point would be an important consideration for a snail asked to take part in a dance. 'Askance' is nearly obsolete in canadian english, although it may be well worth bringing it back into use, as it means to look at someone with disapproval or suspicion. The terms sounds made for use when dealing with politicians. True enough, as long as you're on the east coast of england and not too far north. Today there is no need to sail the 'english channel' (understandably the french have their own name for the Channel, La Manche, literally 'the Sleeve'  or, if that was a typo of my source and it's Le Manche 'the Handle'  how's that for a linguistic double-entendre? ); you can take the train instead through the Chunnel which officially opened in 1994. Or, you can swim the Channel instead, a practice with a surprisingly long history. This is of course another parody of a victorian poem with a heavy-handed moral, this time one by Mary Howitt. I don't remember ever reading this one before, and leaving aside the last stanza which lets it down, the poem is remarkably sinister with its male spider and female fly, especially considering the spider does not act in an especially spider-like way in his mode of furnishing his dinner table. Males typically only spin webs until they are sexually mature, after which they focus on trying to find female spiders to mate with. I'm sure you're very welcome  will you please to take a slice?" Within his little parlour  but she ne'er came out again! Here Alice is thinking about the cod-like fish version of whiting. In a way it's curious that Alice stops short of saying she's seen whiting at dinner, having learned that the Mock Turtle in question is made into soup in Wonderland. Then again, perhaps that's why this Mock Turtle is standing around sobbing. Whiting seem to be very delicate fish to cook as they aren't very big. The erstwhile cook may have tucked the tail of the fish literally in its mouth, but they may also curl up when deep-fried or while they are being coated before frying. The british penchant for coating fish in crumbs before baking or deep-frying it is fairly well known, if a bit puzzling at times. This use of crumbs has been extended to other foods, some not too racy: mozarella sticks, zucchini. Others spectacularly disgusting, including deep-fried chocolate bars and deep-fried macaroni and cheese. More often than not nowadays, a shiny pair of shoes is a vinyl pair of shoes. Originally however, the archetypal shiny shoes were made of 'patent leather.' Such leather is highly processed and difficult to keep up, and it remains a hallmark of having plenty of disposable income. Patent leather shoes fell out of favour somewhat in england after world war one, if Agatha Christie's description of her detective Hercule Poirot is anything to go by. 'Blacking' was one of the first mass-produced shoe polishes, appearing in the 1800s. Prior to that date, making up shoe polish was one of the many duties of a housewife or servant. The word 'blacking' itself seems to have referred to a polish that was coloured by adding lampblack, a type of soot. The fish called a sole does seem to be named by analogy with the sole of a shoe, based on shape if not flatness. It is a type of flatfish, fish that live their lives laying on one side on the bottom of the sea. The eye that would otherwise stare permanently into the sea bottom migrates to the upper side of the body as the fish approaches maturity. Here we have an aft-shadowing to the Mad Tea Party as well as a good illustration of how not to check what someone means if you think they've misspoken. Here we have another instance of 'aft-shadowing' which could also be seen as foreshadowing, in this case a means of subtly showing that the story is drawing to a close. In my reading experience, it is fairly unusual for written stories in european traditions to look back to their earlier events in this way. This suggests the question of whether this is a feature to look for in stories that were originally spoken rather than written, as Alice In Wonderland happens to be. In terms of books or stories or books that literally circle back to their own beginnings, I know of only one, Gödel, Escher, Bach: The Eternal Golden Braid whose author Douglas Hofstadter makes intriguing use of Lewis Carroll's version of Achilles and the Tortoise of Zeno's Paradoxes fame. Zeno of Elea was a greek philosopher with a penchant for developing paradoxes based on everyday activities like trying to walk a short distance. Except that previously, Alice's attempts to explain herself or what she means have sharply curtailed most of her conversations with other people or talking animals. 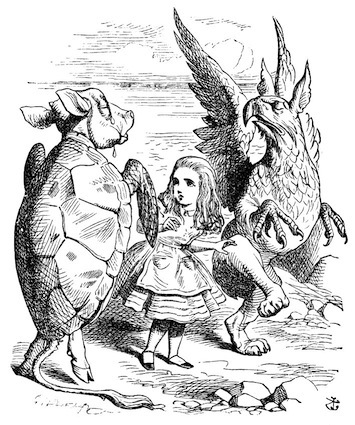 Arguably things have gone a bit better with the Mock Turtle and the Gryphon for Alice, ironically because she has hardly had a chance to speak at all. 'Creature' is quite an interesting word. As its spelling still suggests, it is from the same root as 'create' and originally could refer to pretty much anything. Today it tends to be reserved for animals of all kinds, or the sorts of beasties that mad scientists and sorcerers are supposed to cook up in their laboratories. Generally creatures of the later type are staples of horror stories from Mary Shelley's Frankenstein to the Terminator movies. This is quite a good use of the verb, although a rather rare now in canadian english, possibly due to the strengthening of its sexual connotations. A similar use I can think of that would be ordinary speech is something along the lines of, "She's coming tomorrow," meaning "She will be arriving tomorrow." In Carroll's time this usage was probably just ordinary rather than clever, because clearly you can't control when somebody or something else arrives if you are waiting at the destination point. This is certainly Alice's experience of trying to recite poetry in Wonderland, where she may be sure she is going to recite something, and that whatever her rendition will be it won't be the ordinary one. And remarkably, Alice behaves in the same way, most likely because both creatures seem to be older than her. Remarkably, there is such a thing as 'hair sugaring'; it is a method of hair removal that has apparently been in use at least since the time of the Ancient Egyptians who would have used honey. 'Trim' appears to mean to decorate the body or make tidy here. 'Lark' is a term used for many ground living song birds, especially one with a revered morning song. The word is also a verb meaning to play tricks or play actively. It seems like Alice must be referring to ballet, yet her wording is very general. Perhaps 'turning out the toes' applies to all types of formal dancing such as those taught to upper class young ladies in the victorian period. It's fairly rare in canada for 'pie' on its own to refer to a meat pie. Due to the influence of the french, meat pies are often referred to as tourtière instead. However, that sort of meat pie is not the same as what I have experienced as a ukrainian meat pie, which usually doesn't have a pie shell top. The english are of course famous for 'steak and kidney pie' which may well be what the Panther is eating more than his share of here  but then again, he is saving the Owl for desert. A spoon is quite useless for eating meat pies as a general rule, especially if the meat hasn't been ground up. If you read enough Victorian era novels, and probably from several other eras besides, you will find repeated references to 'counting the spoons and silverware' after someone of a 'lower class' has visited whether socially or for work purposes. I can't remember my own experience of reading this poem for the first time at the age of seven, but can't imagine I would have been different than any other kid who can't resist a ghoulish chuckle at finishing the verse. Poetry is notorious in its extremes, running from either the dreadful officially 'didactic' but in reality miserably condescending stuff Carroll is parodying, to verses so remarkably opaque they have generated an industry of interpretations. Practically speaking, you can't explain poetry as you go, yet this rather cranky demand is not uncommon. Over time I've come to the conclusion that reading or hearing poetry is quite reminiscent of listening to a language being spoken that you are still in the early stages of learning. If you fixate on what you think you know, the rest zips right by you and there's no chance to really hear it, and of course, you may need to hear the speech more than once. In effect Alice is taking advantage of a turn of the tables here, as it gets her uncomfortable companions back into recital mode rather than herself. I've noticed that song lyrics don't tend to be examined in quite the same manner as poetry that hasn't been set to music, unless the singer or band is popular with young people. Then all hell can break loose. One of the most infamous examples is of course the Beatles' Lucy In The Sky With Diamonds. The expression 'there's no accounting for tastes' is actually quite old. It has been recorded in latin: "de gustibus non est disputandum" and refers to the mysteries of why one person's favourite thing can inspire another with utter disgust or confusion. The use of the idiom tends to fall off dramatically if the people inspiring it are the object of a colonizing gaze. Alas, there doesn't seem to be an obvious parody here, unless it is one of the sentimental songs families not uncommonly sang together after dinner until radios and then televisions became widely available. Apparently a tureen is a deep dish you serve soup from, as the context of the word suggests. Like any dish, it may be more or less extremely elaborate, although most of us are probably most familiar with earthenware tureens like those used in slow cookers. Wikipedia repeats briefly a rather risible explanation of the name of the dish as from a french marshal named Turenne. However, since the usual material a tureen is made from points to a more sensible connection to an old french term for earthen, and indeed that may be the source of Turenne's name as well. Perhaps his antecedents were potters! The common and nowadays more and more disrespected 'penny' can be found in england as well as all of its former and current colonies. In many of those places, the penny is the smallest division of the basic currency, in canada the dollar (a separate currency from the american one), in england the pound. The word is an old germanic one, and indeed analogous german coins are called pfennig today. Several countries are considering taking their pennies out of circulation altogether, including canada (which stopped production of its penny in 2013), and apparently australia has already stopped using a penny. The english penny before the currency was decimalized was quite large, around 3 centimetres. You can see a similar coin for at least a moment if you watch the movie version of Angela's Ashes by Frank McCourt. If you have any doubts about the nature of inflation, it can be instructive to look into some of the things it used to be possible to buy in 'developed' countries with a penny. The example my own mother refers to most often is 'penny candy' which nowadays starts at a quarter apiece (25 cents) if the shop owner is generous and you're lucky. It also used to be possible to get a decent helping of some cheap, hot food such as soup, chips, or sausages for just a penny.